Reggie Middleton's BoomBustBlog - The Pan-European Sovereign Debt Crisis: If I Were to Short Any Country, What Country Would That Be.. The Pan-European Sovereign Debt Crisis: If I Were to Short Any Country, What Country Would That Be.. This is a trick question, for the fates of many European countries are now inextricably tied by what appears to be a poorly conceived methodology of handling diverse political and economic entities under a single currency without a truly authoritarian governing body. Basically, it's the old American saying, "Too many Chiefs and not enough Indians". If one member faces a harder landing, chances are that several others will follow. When I first started this series, a few pundits accused me of being sensationalist. I assume their weren't studying the numbers. It's funny how a few days can bring so many to your side of the table. Now it is becoming much clearer that this is more of a pan-European issue than a pan-Hellenic one. Economic Recovery Almost Stalls as Germany Unexpectedly Stagnates as the IMF Joins EU, ECB in Pledging Support for Greece. This is an extreme blow to the credibility of the Euro. Just a year ago, (silly) pundits were speculating that the Euro would replace the dollar as the world's reserve currency, and now the IMF is coming to a EMU members aid just has it has third world and emerging countries. Crisis and What Country is Next in the Coming Pan-European Sovereign Debt Crisis? for the first two parts. weak footing going into 2010. National deficits have increased in many countries belonging to the European common currency. Even Speigel states: European Union Sees Threats to the Euro - Late last year, it became fashionable to predict the dollar's demise. This year, however, shaky state finances within the European common currency zone have many worried about the future of the euro. Even the EU thinks the monetary union could be in danger. believed the Pound, Euro and oil would all head sharply southward." 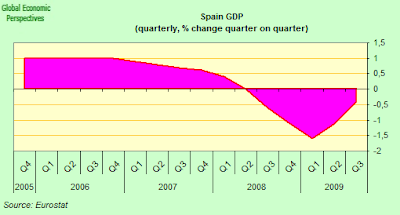 supplied to Eurostat by the Spanish Statistics Office (INE). 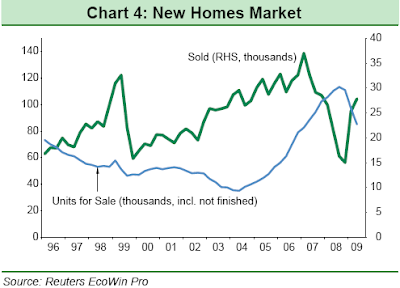 companies and for young people looking to buy homes is hard to find. 2008 the structural dynamics of the Eurosystem were different from now. Italy are dependent on exports and just keeping their head above water. 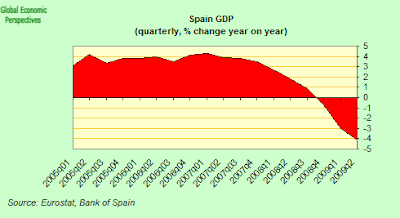 Spain, on the other hand, fails to recover and continues to contract. While denied by the EMU members, it appears to be without a shadow of a doubt that fractures are showing in the monetary union. The Euro was not well concieved. It gets worse. The stresses to the Euro will also come from well outside of the European Union. Many of the Euro countries have significant exposure to central and eastern European countries who are significantly more fragile than the one's mentioned above. This exposure will easily daisy chain through Europe if it were to ignite. Well, the CEE countries primary trading partners are in the Eurozone, and as the Eurozone slows down, the chances of CEE issues increases. That will be the subject of my next Pan-European Sovereign Debt Crisis post and I will have several specific banks on a detailed watchlist for paying subscribers to download, which should help you ahead of the curve. As I stated in parts one and two of this series, although Greece is in bad shape, it is a drop in the bucket in comparison to the problems abound in the other countries. Paying subscribers can download a tear sheet on all Spanish banks investigated here: Spanish Banking Macro Discussion Note 2010-02-09 02:48:06 519.40 Kb). Paying subscribers can also download the 11 page tear sheet featuring 7 Italian banks worth noting, including one with a 100% ratio (meaning the bank has more non-performing assets than it has equity = insolvency!) Italian bank here: pdf Banking Macro-Fundamental Discussion Not" width="16" height="16" /> Italian Banking Macro-Fundamental Discussion Not pdf 2010-02-09 17:00:40 pdf 792.07 Kb . With all of the needs for sovereign debt issuance, the private sector will most assuredely get crowded out. This is probably worse than it sounds, since most banks are still coddling significant hidden losses and NPAs (even though many are reporting profits and paying bonuses), hence will not be lending anytime soon. There will be no recovery without available credit, and if there was ample credit supply available (which there really is not) the sovereign nations will be soaking it up anyway. The weaker Eurozone countries will start flooding the market with sovereign debt rollovers starting THIS MONTH. It remains to be seen whether Germany will backstop Greece, but if they do how can they avoid backstopping Spain, Portugal and Italy. The Spanish and Italian backstops will be particularly tricky since there are bank NPAs hidden in their whose extent has been purposely kept a big mystery. Reference the NPA as a percetn of GDP chart above. If Germany doesn't backstop these countries then it's left up to the IMF and their goes the credibility of the Euro. If Germany does backstop the countries, then their goes those Bund rates! An interesting conundrum, indeed.